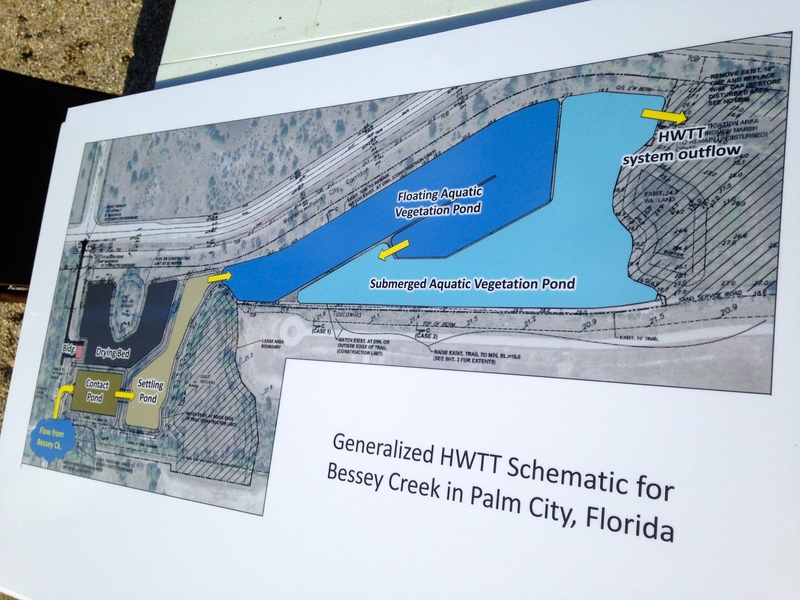 Because of my Sewall’s Point commission position, I received an invitation to attend yesterday’s groundbreaking of Martin County’s “Bessey Creek Hybrid Wetland Treatment Technology Project” ceremony located about 2.1 miles north of SW Citrus Boulevard in Palm City. I was honored that they invited me, so I decided to go. I have read about the project for a couple of years now, but of course I am no expert on chemical cleaning of filthy storm water running into our waterways. 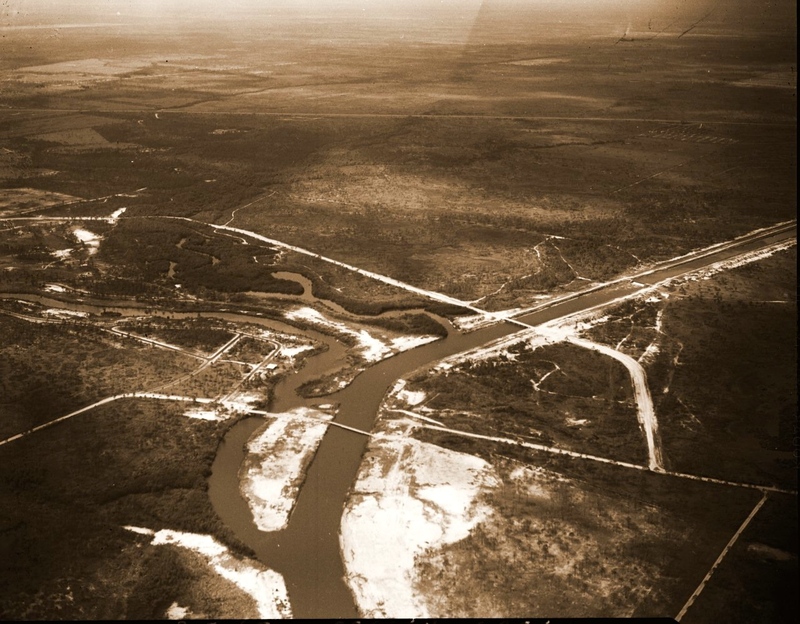 I always think of the mouth of Bessey Creek, which intersects with the notorious C-23 Canal as the border of Martin and St Lucie Counties, when I think of Bessey Creek. Years ago, before the draining and canal building of the 1920s and after, these Palm City area lands were mostly “wetlands” but now they are “dry.” When I was young, it was mostly cows “out here,” but now it is thousands of people and agricultue. 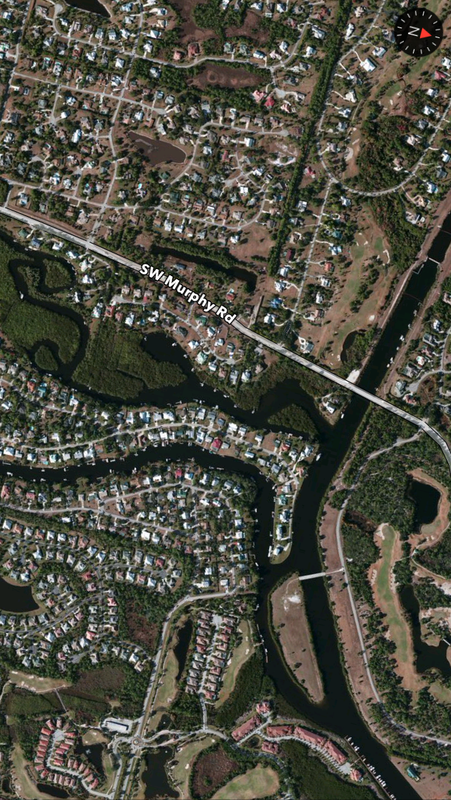 This photo is more south-easterly showing where Bessey Creek exits into SLR. (Google Earth) Today’s version of 1965 photo at beginning of this blog post. 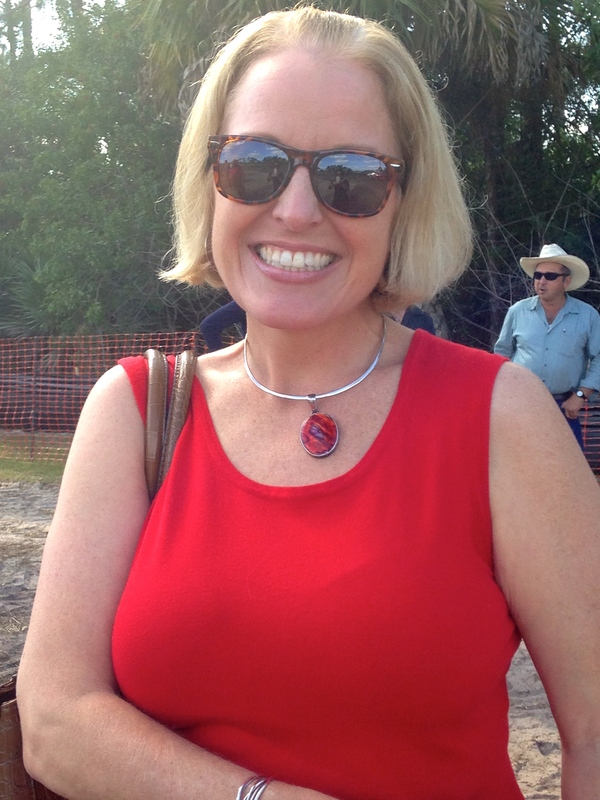 The groundbreaking was very well done and elegant Vice-Chair of the Martin County commission, Ann Scott, led the ceremony. Commissioner, John Haddox, was there as well. 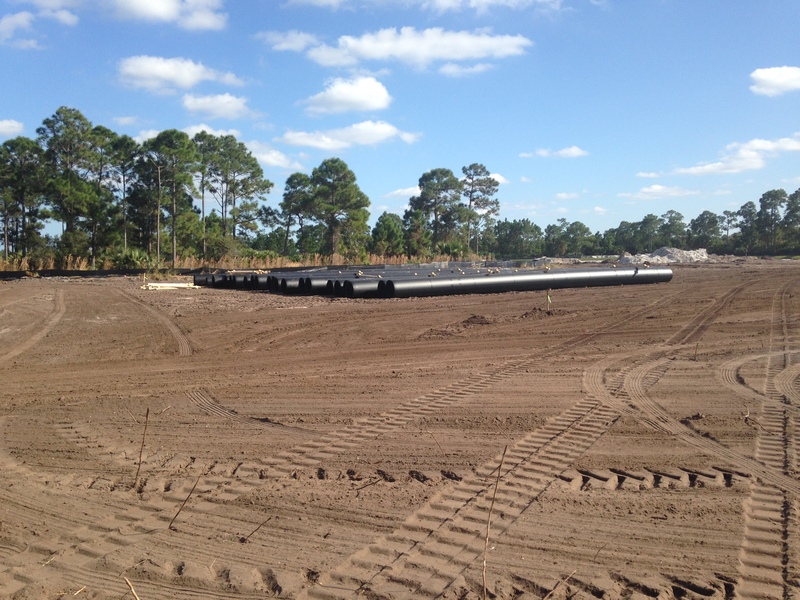 Deb Drum’s team, from the county’s Ecosystem Restoration and Management Division of the Martin County Engineering Department is the lead organizer for the project itself. One of the many things they are working on! 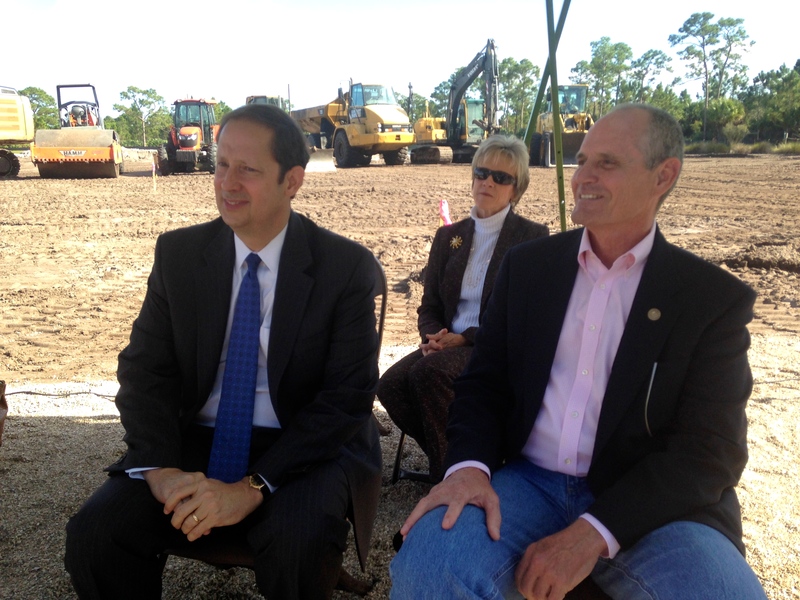 The Florida Legislature, especially Senator Joe Negron, and the Florida Department of Agriculture also very much helped with this 3 million dollar “turn dirt” project. According to Mr Budell from the Department of Agriculture, the Bessey Creek project is one of about 10 in the state and mid-sized in comparison. After the ceremony, Tom Debusk from the company “Watershed Technologies” (http://www.watershedtechnologiesllc.com/technology/) gave a presentation explaining how the system operated. The link above is an excellent resource and also has previous articles from TC PALM. 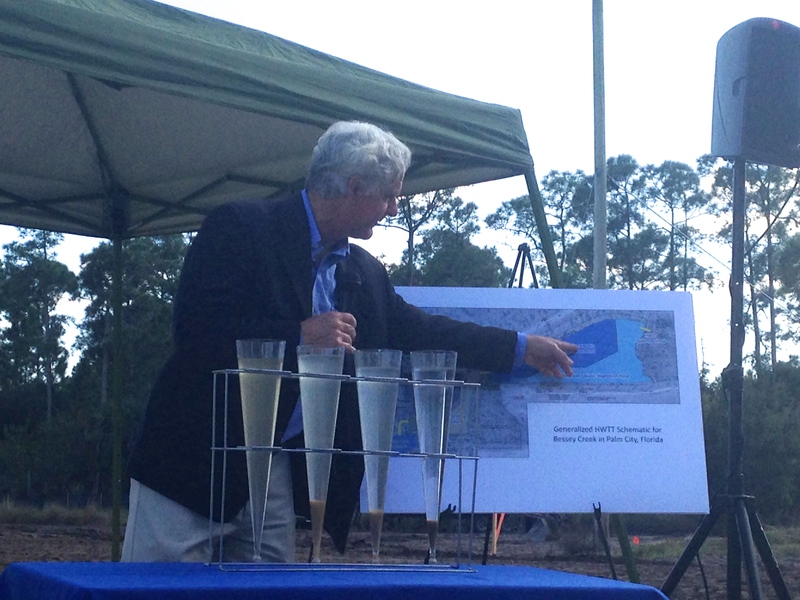 As usual, during the presentation, I had to ask a lot of questions to understand, and Mr Debusk was very patient with me, but basically the remaining pathetic “headwaters” of Bessey Creek start somewhere between Boat Ramp Road and Citrus Blvd, close to where we were all standing. The county is leasing (for almost nothing) this land from the state. It will be up and running in one year. Well, simply put, a pond like treatment area will be built and take diverted waters from Bessey Creek and treat them with a combination of aluminum sulfate (basically a salt that is non poisonous and has natural properties to clean water (http://en.wikipedia.org/wiki/Aluminium_sulfate,) and aquatic plants that will “uptake” mostly phosphorus, but also some nitrogen, and other pollutants from the water. 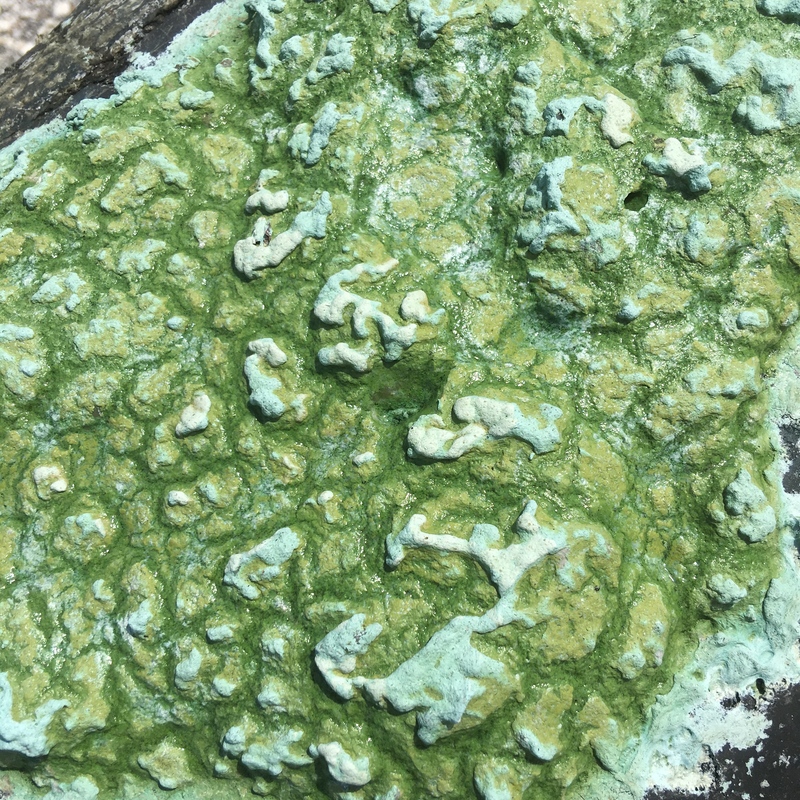 So pollutants will be “separated” or “taken in”….leaving the water clean as it meanders to the St Lucie River/Indian River Lagoon. 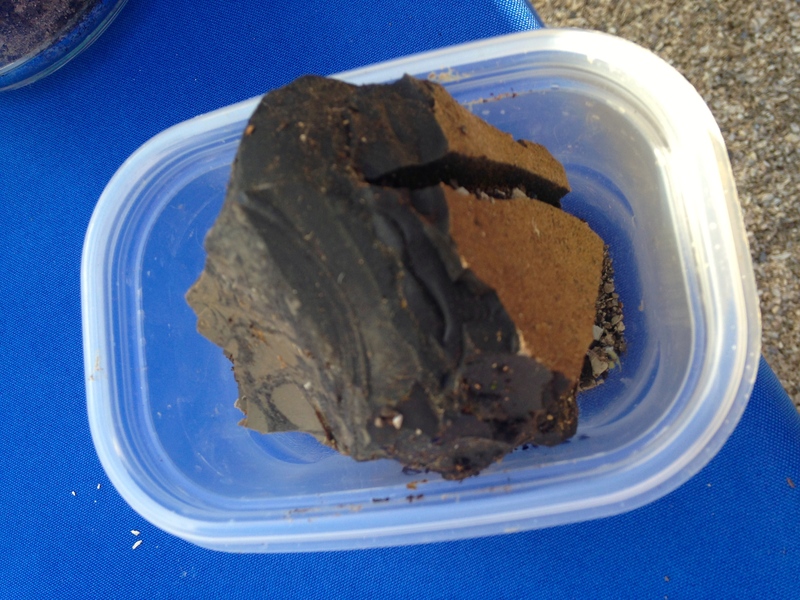 Concentrated removal of pollutants from water, now as hard as a rock. 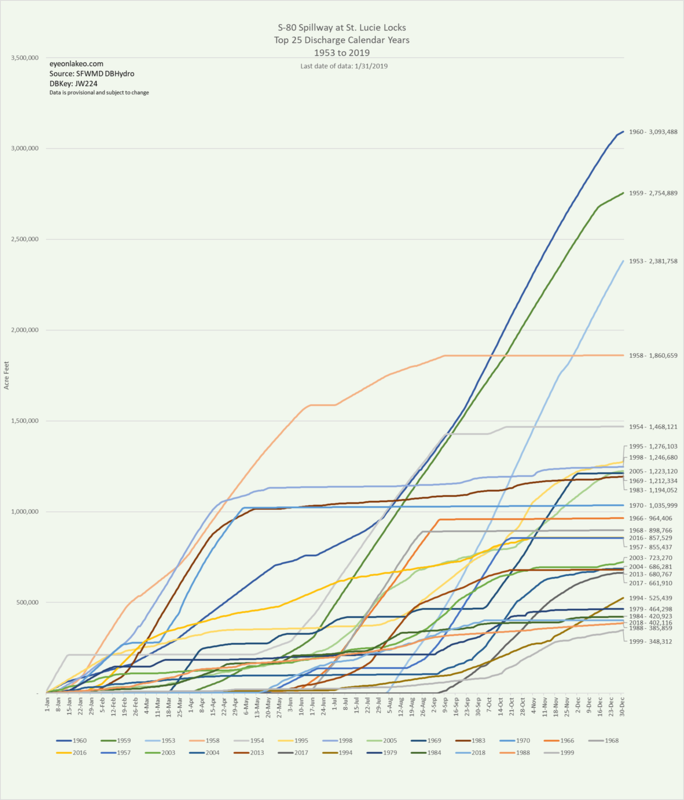 ….Kudos to Marin County and the State for their efforts! Thousands of years ago, humankind found a way to avoid the constant nomadic life of following big game, becoming more self sufficient, learning the art of agriculture. Nothing has made our lives better. Unfortunately, after thousands of years of its evolution, nothing has made our lives worse. Don’t get me wrong, I realize that agriculture an important industry, the second largest after tourism, in the state of Florida. Still, we must look at its issues and try to make things better. 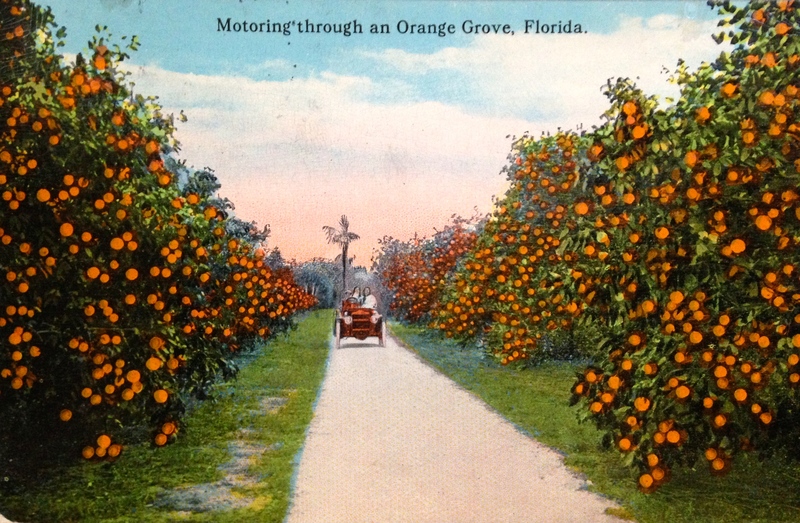 Much of the land in our area is devoted to agriculture as well, particularly citrus. 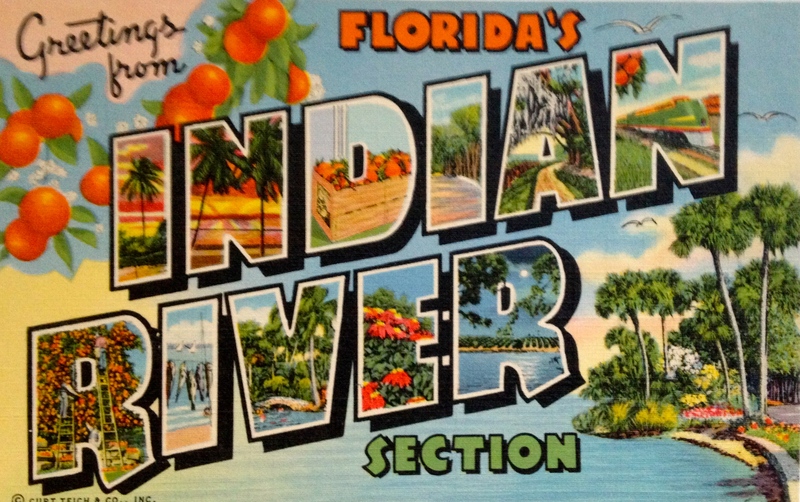 The Indian River Lagoon region is famous for its delicious citrus and although the industry is in decline due to canker, it has had huge impacts on the IRL area due to the canal system built to drain the land and water the crops. 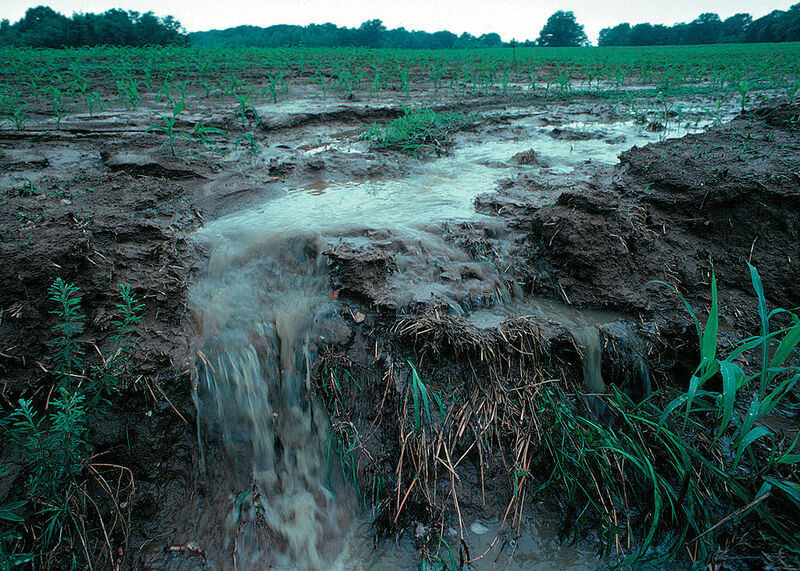 The muck that has entered the lagoon since the early 1900s is mostly from erosion of canals, due to the runoff from agriculture as they drain their lands that were once swamp or wetlands. 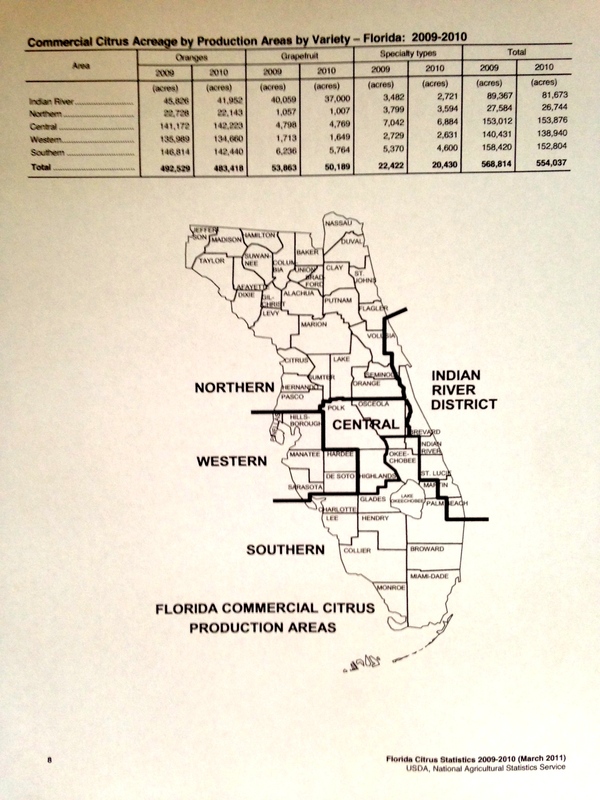 The USDA documented 89,367 acres of citrus in the Indian River Lagoon region in 2009, declining to 81,673 in 2010. 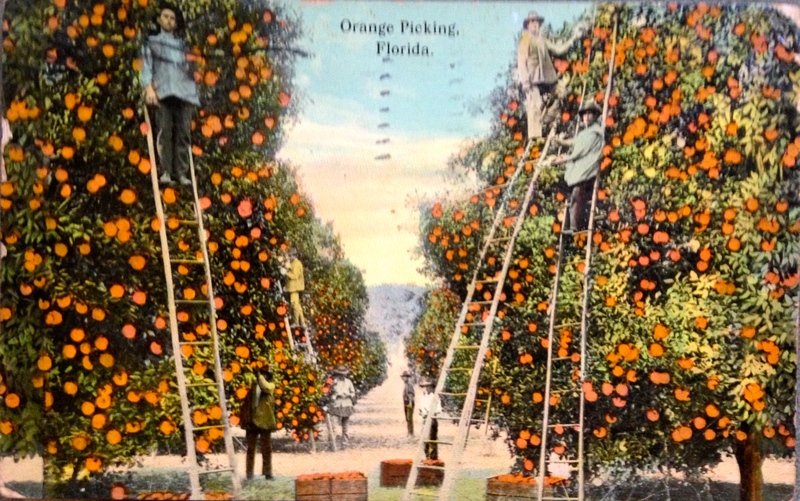 There is a lot of land devoted to citrus, land that has been radically altered from its original state and affects the Indian River Lagoon as there are literally thousands of miles of canals attached and interwoven along these groves. All eventually dump to the river or other water body. 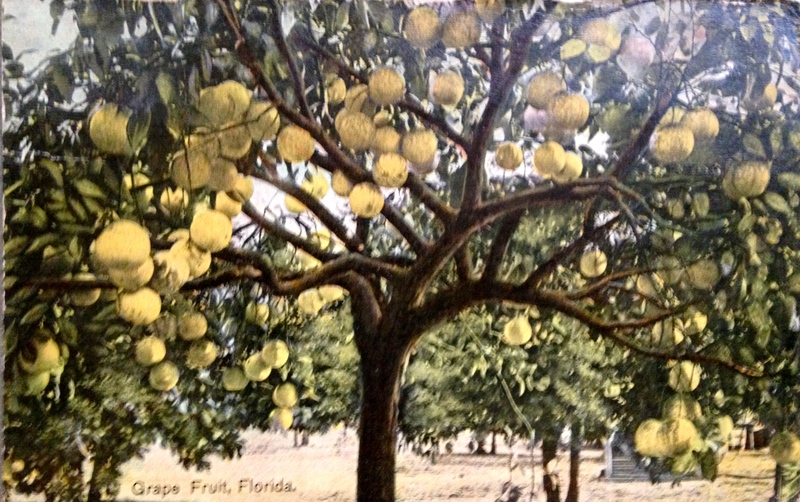 Reading through the documents it is noted that many of the agricultural areas are quite old, as the post cards I am sharing today from my mother’s collection are from 1912 and 1914. According to the FDEP, many of the areas around Ten Mile Creek did not have BMPs, or best management practices in place, as they were there before such rules were voluntarily implemented in the 1980s and 90s. I don’t get it. Our environmental agencies have seen the writing on the wall for decades and even with the modern implementations of BMPs, (http://solutionsforyourlife.ufl.edu/hot_topics/agriculture/bmps.html) where farmers try to minimize their impacts on our waterbodies, the rivers, estuaries, and lakes are filling up with excess nitrogen and phosphorus from fertilizer and other pollutants at an alarming rate. 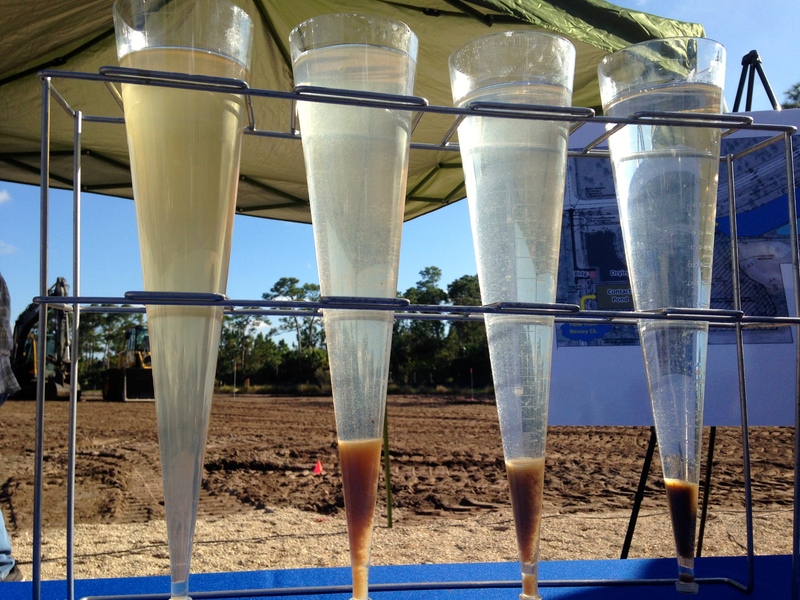 Yes, the FDEP is implementing TMDLs or total maximum daily loads through the BMAP, or basin management action plan, where municipalities and counties are required to lower their nutrient levels in waterbodies, but these are 15 and 30 year goals, that most certainly will take longer to truly implement. Also agriculture is exempt under the law and Right to Farm Act. They, as mentioned, implement BMPs but it may take fifty or more years to get all farms up to speed, if ever. Do we have that much time? 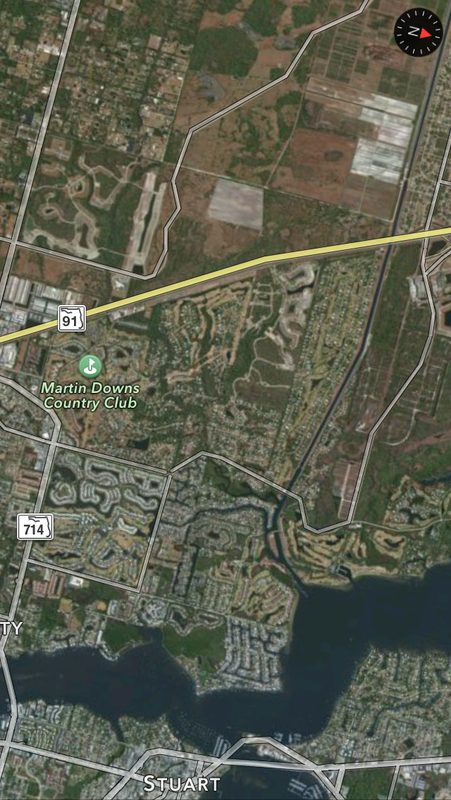 In the meanwhile, we watch or rivers dying from local runoff from C-23, C-23, and C-44 supporting the citrus and agriculture industries in Martin and St Lucie Counties. 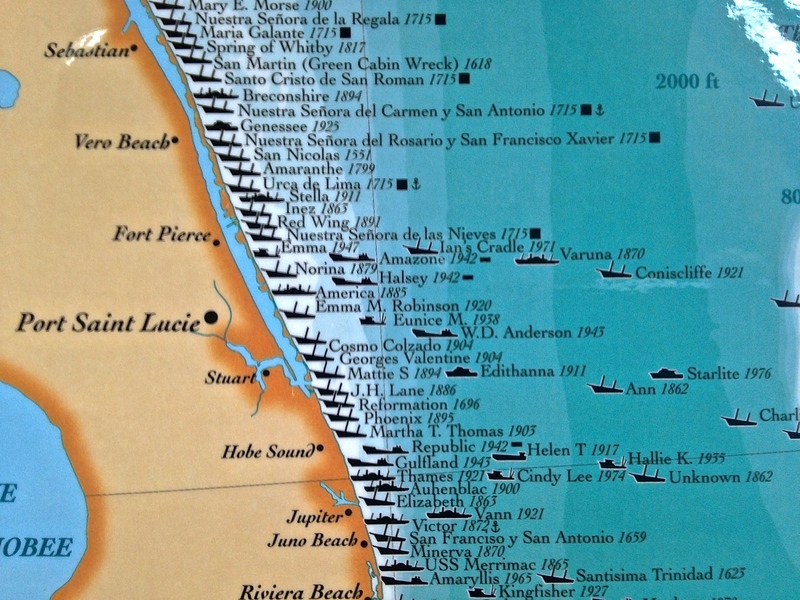 On top of this, during major rain events, Lake Okeechobee, also full of agriculture runoff and high nutrients suspended in muck, from the sometimes back pumping sugar industry south of the lake, pours into the St Lucie River as well, wreaking any work we have done locally to meet local TMDLs. 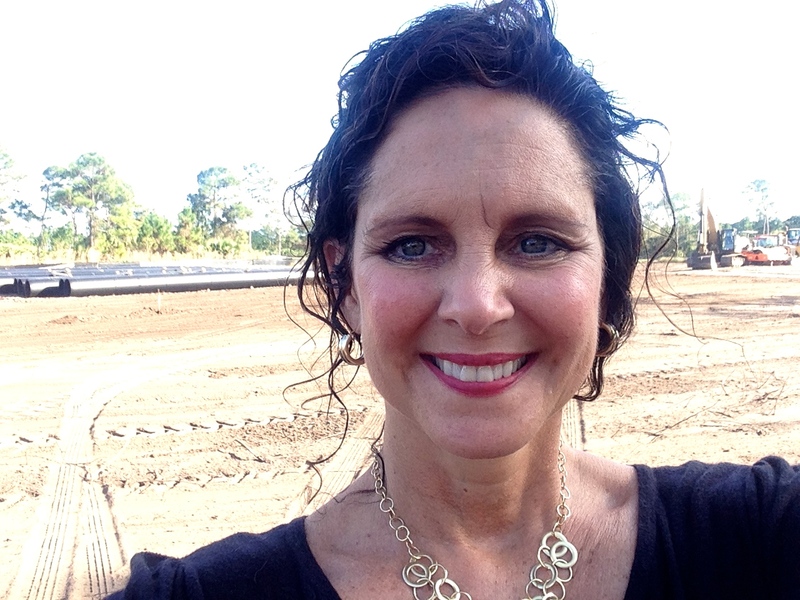 Would I rather see the citrus lands developed for houses? No. I rather fix the problems we have. And even though its called “corporate welfare,” I think state, federal, and local governments must help agriculture operate in a way that is not killing the environment. Some of the funds from the state this year that came out of the Senate Hearing on the IRL are doing this and the state really has been helping “forever,” but quietly, under the radar. It is time to come full out to the public and explain the situation: we must feed ourselves and support our historic industry, but agriculture/citrus is killing our waterways. In conclusion, of course the industry should make every effort itself to improve the situation, and some are more than others. In any case, we cannot just point fingers at them, we must help them. Perhaps we should bond together and put into law even better, stricter management practices, that will give the children of our state a future, not just eating, but also fishing, swimming and boating in a clean river.